Preserving the bounty from your homestead is an important skill to learn. Not only will it save money and provide healthy food for your family but it also helps you prepare for lean times. Fresh veggies from the garden, fruit from the orchard, or meat from your livestock can all be preserved at home. One of my favorite ways to preserve food is by canning. Once the jars are safely sealed, you may keep your harvest for several years without electricity. High acid foods, such as fruit, pickles, and jam may be preserved with a hot water bath canner. 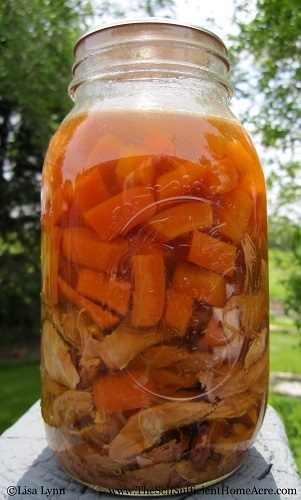 The acid in the food, along with proper processing, prevents the growth of bacteria in the jars. Low acid foods, however, need to be processed in a pressure canner to safely preserve them. Meat, poultry, fish, and many vegetables fit in this category. Chicken soup made from my own chickens and vegetables. Before you begin, make sure you read the instructions for your pressure canner and check the condition of the canner. If the gasket is warped, cracked, or feels sticky, you should replace it. (Note – some pressure canners are made to operate without a gasket. These are nice because you never have to replace the rubber gasket!) Be sure that the overpressure plug is in place and the pressure vent tube is clean. The pressure cooker/canner will have an automatic pressure control that is either weighted or a dial. Either one is fine but it must be a selective pressure control, allowing you to choose the proper pressure for canning different foods. The weighted control should allow for 5, 10, or 15 pounds of pressure. If you have never used your pressure canner, or if you are concerned that it may not be in good condition, contact your local extension office. They may be able to check the canner and answer your concerns. Use vegetables from your garden to can homemade soups. Check to see how many canning jars your canner will hold. The jars may touch. My Mirro pressure canner holds 7 quarts or 9 pints. Once you know how many jars you can process at a time, you have a better idea of how much food to prepare. Wash the jars thoroughly with hot, soapy water. Make sure there are no chips or cracks in your jars. Wash the screw tops and follow the manufacturers directions for preparing canning lids. 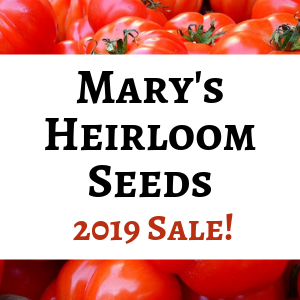 (*Note – Ball lids are now made BPA free and they should not be heated…read about it on here on Living Homegrown.) Prepare the food you will be canning. You may can beef, pork, venison, fish, chicken, turkey, or other poultry with a pressure canner. You may also can soups, stews, chili, and sloppy Joe mix as long you use the longest processing time with the highest pressure required for any of the foods in the mixture. For example, chicken soup containing chicken, broth, potatoes, celery, and carrots will need to be processed for 90 minutes at 10 pounds pressure for quart size jars – the requirements for canning chicken, which has the longest processing time. Getting ready to pressure can soup. Beef, pork, venison, and lamb will need to be boned before canning. 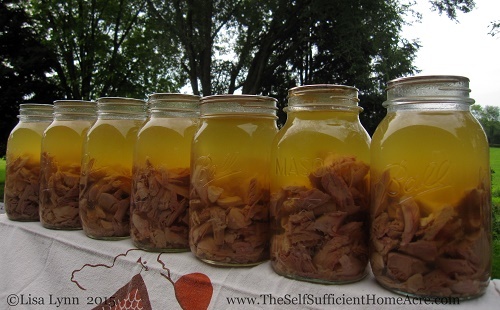 Chicken, turkey, rabbit, and duck may be canned with bones in, but I prefer to remove all bones prior to canning. Fish may be boned or canned in large chunks, bone in. Helpful Hint! Add a splash of vinegar to water in canner to prevent mineral buildup if you have hard water. Follow these processing instructions for the foods you are preserving. Begin timing when canner reaches proper pressure (control begins to jiggle). Process all of these foods at 10 pounds of pressure (15 pounds if your elevation is over 1000 ft). Process pint jars for 75 minutes, quart jars for 90 minutes. Process pint jars for 65 minutes, quart jars for 75 minutes. Process pint jars for 110 minutes. It is not recommended that you can fish in quart jars. Salmon should not be cooked first. Pour hot water over salmon and scrape dark color from skin. Process pint jars for 20 minutes, quart jars for 25 minutes. Skim all fat from stock before canning. Filling pint jars with Beef Chili. Once your jars are packed, settled into the canner, water is added, and the lid is properly in place, you will need to heat things up. Turn the heat on (I find it works best to slowly heat the canner up, preventing liquid from escaping from jars from the uneven pressure) and wait for the lid to lock into place and steam to escape from the vent tube. Allow it to steam for 10 minutes, then place the weighted gauge in place (if this applies to your canner). Wait for the pressure to build up, causing the gauge to jiggle. Begin timing at this point. The gauge should jiggle 3 times per minute or slightly more. If it is jiggling a lot more than this, slowly adjust heat down. Do not use a smooth glass cooktop for canning. The burners are not designed for this purpose. You may purchase a separate burner to use for canning, or you may set up a propane burner outside. Do not make big adjustments to the heat under your canner as it is processing. Swings in temperature will cause uneven pressure between the inside of jars and the canner. It is advisable to do a ‘wet run’ before you start canning foods. Put the recommended amount of water in your canner and process without any jars of food inside. This will allow you to get the hang of canning without potentially ruining any food or breaking jars. It is normal for a small amount of steam to sputter from the overpressure plug as the pressure builds up in the canner. If the lid isn’t locking into place, you may need to adjust it so that the locking mechanism lines up properly. Use potholders to protect your hands. It is very important that when the processing time is finished, you allow the canner to cool slowly until the pressure has returned to normal. Do not put your canner in cold water, remove the pressure gauge, or try to open the lid. You may damage the canner, cause the liquid inside jars to bubble out, or you could scald yourself. It may take several hours for the pressure to slowly stabilize so that you may remove the lid. Pressure never builds up – gasket may need to be replaced, over pressure plug may need to be replaced, locking pin may not be lined up properly, burner may not be hot enough. Pressure gauge stops jiggling – water inside canner may have all evaporated off (may cause burned scent), food may have stopped up vent tube. Turn burner off, allow canner to cool and pressure to drop to normal before opening canner to investigate. Liquid escapes from jars, leaving larger head space than recommended – canner heated too quickly, cooled too quickly, or heat levels were not stable during processing. If jars are sealed, the food should be fine to use. 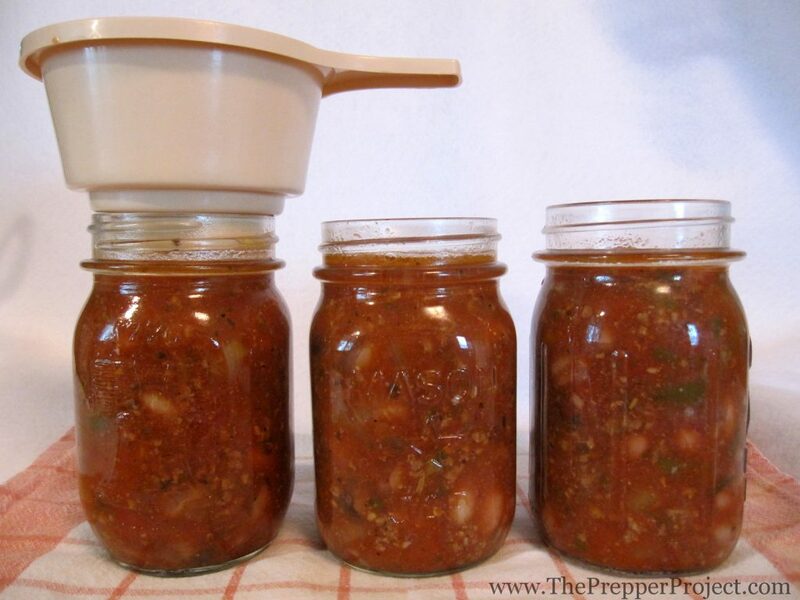 Freeze jars if you are concerned about safety, making sure that there is enough room in jar for liquid to expand. Jars don’t seal. Review instructions on box of canning lids and make sure you are following them. Most lids need to be heated in water before placing on jars. Do you pressure can your own meats, poultry, and fish? Do you have any helpful hints for best results? For more information, visit the National Center for Home Food Preservation. Too Many Chickens? Make Soup! I’m going to try this today! I’ve had success with bottling grapes for jelly and now that I’ve got 3 too many roosters in my flock I’d say it’s time to make soup!! I’ve already precooked the meat, cooled it and separated it from the bone. Bone broth is simmering on the wood stove so now to pack the jars with veggies and chicken. Do the veggies go in raw? Does the water/broth go in cold or boiling or does it matter? Hi Lara…sorry to keep you waiting! The veggies can go in raw, I put very hot broth or water in the jars. Best wishes! Good for you for canning up your own chicken! Hi Lisa: (Questions asked here are for anyone who wants to answer or share your experiences and thoughts). being “tasty”! Therefore, I just decided that canning meat or fish was something I never would do! made it sound more “palatable” somehow. So now you have peaked my interest and therefore I now have some questions. So, say for instance, I want to can some ground beef for spaghetti, for tacos, etc. Then I would first crumble the ground beef in a skillet and brown it in the frying pan til it starts to get browned and then put it in the canning jars, right? OK, so then what about if I want to can more ground beef to make hamburgers or some meatloaf out of it? Do I shape the meat into burgers and partly cook them, like to med. rare, or medium? Then for the meatloaf, do I shape the ground beef into shape of a meatloaf, (seasoning it like normal), and then partially cook it to med. rare or medium? OK, so then with meats, do you add water to the inside of the jars? Wouldn’t the water more or less then, “boil” the meatloaf and/or the burgers? Plus wouldn’t it also more or less, “wash-out” the seasoning/taste that you use? Then too, wouldn’t the water also cause the meatloaf or burgers to be watery and break apart it’s shape? Now on the poultry and the Salmon, (I think it was just the Salmon, and not any of the other types of fish, right??? )………So on the poultry and the Salmon, being put into the canning jars “raw”, you still fill up the jars with water, leaving some headroom in each jar…..So then by the time you have finished the “canning” times, all of the fish and the poultry are then “cooked”, right? Because it has been “boiled”, right? So then can you open up that can of Salmon and season it and “Grill it” still? Also, with the Salmon, wouldn’t it be all broken up, (sort of like tuna fish in the can or the pouches)? OK also, I wasn’t really for sure I got what you said about the fish? So do you pre-cook all fish, with the exception of the Salmon? If I went deep sea fishing and got a tuna and decided to can it, would I pre-cook it? So then, when you pre-cook any of the meats, you said not cooking the meat all the way, so then when you then put it into the canning jars and add water, then while it is being canned for those 90 minutes or whatever the time would be for that particular meat and size canning jar, does that complete the cooking of that meat the remainder of the way? So then all you do before you serve and eat it, is to heat it back up? One last thing, I think, if I am remembering correctly, that you can reuse the jars as well as the screw rings, from one year to the next, simply washing them and also sterilizing them in a water bath prior to using each year, is this correct? How long do you water bath your jars and lids? Is it different times for the pint jars than the quart jars? But I heard that the lids won’t ever re-seal after the first time, so you are supposed to throw them away when you open a can and use it all up, is this correct? They give a lot of information there that is very helpful. Whether you precook any meat, poultry or fish before canning, it will be thoroughly cooked once it has been canned. Yes, you are basically boiling them. You can add 2 tsp of salt to each quart jar, as well as herbs and spices to make them tastier. Ground meat should be browned first and then drain the fat before canning. Add water, meat broth, or tomato juice to fill jar, leaving 1″ of headspace. It is not necessary to precook any fish before canning. They tend to crumble up and break apart. You would not really be able to grill any fish after canning. You can form ground meat into meat balls, but you would have trouble forming it into burgers or meatloaf and then put it into your canning jars. 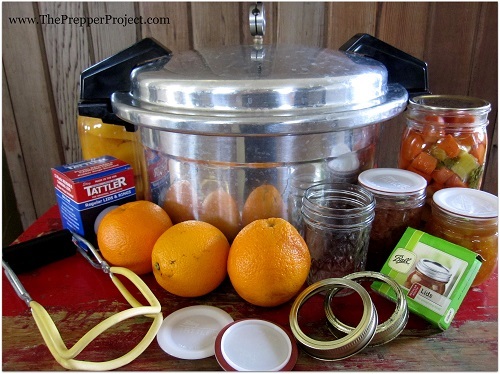 You do not need to sterilize jars, lids or screw bands before pressure canning. Just wash jars and screw bands with hot, soapy water and rinse before filling. It is not recommended that lids be reused. Some people have told me that they do, but I think you would have a higher incidence of jars that don’t seal properly and it isn’t safe to do. You can order Tattler reusable canning lids. They cost more and I have had problems with them not sealing as well as the one use lids. But some people swear by them, so maybe I just didn’t do it right. Pingback: Too Many Chickens? Make Soup! Great information! 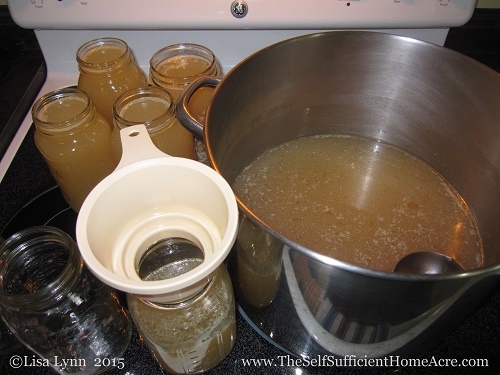 I just started using my pressure canner and canned up all my chicken broth! That’s great, Nancy! Best wishes with your canning adventures! I love having canned meat on hand! Great tutorial! We got a canner from a second hand store and ordered a new gasket online right away. I didn’t want to take a chance the old one was faulty and ruin a lot of hard work. Just a little tip. I’m sorry to hear that your Gram’s pressure canner didn’t make it into your kitchen 🙁 You might be better served with one of the newer models, anyway. So, chin up! You could ask for one for your birthday 😉 Best wishes! Using a pressure canner can sure be intimidating at first. Now that I’m used to it, I use it a lot for meats, broth and vegetables. Great post! I’m glad you got past your fear, Kayla! I don’t have a pressure cooker anymore, but I always check the second hand stores. I just don’t think I would do enough to justify the price of it new, but maybe one day! Thanks for the great info. I love this post! You have explained the process in simple and understandable terms! 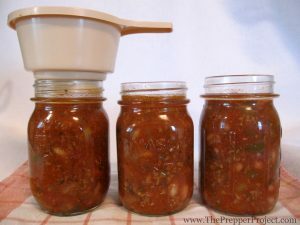 Being a canner myself, I think that everyone should learn how to use a pressure canner! The ability to be able to store meats (fish, poultry, game, beans, etc..) without the need for a freezer is so important. Also, canned meats and beans are so convenient – just pour into a pot, heat and eat – No thawing or additional cooking time required! Thanks so much, Vickie! I’m glad that it is easy to understand…sometimes I’m not sure if I explain it well. It sounds good in my head! It can be fairly time consuming, but if the power ever goes out, that time has been well worth it!